Delays and echoes are the sauce that adds the required vibe to any modern vocal performance. But don’t be fooled, not all delays are created equally! There’s short delays, long delays, bright delays and trippy delays just to name a few. 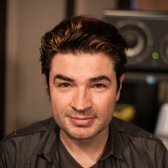 In this tutorial Fab Dupont guides you through how and why he sets up short, medium and long delays on a mix. From subtle halos to sparkling spices, glowing auras to cushions of clouds, delays are an essential element of any modern mix! Good morning children! Today, we are going to take a majestic step towards world peace by learning how to use delays on your vocal tracks so they can sound every bit as good as those inspirational artists such as Katy Perry, Britney Spears, and Kenny G.
Isn't that wonderful? It can be very difficult to figure out how people do it on records because the vocal is almost never in solo, and most of the time, little secret, when the vocal gets to be in solo, the engineer tends to modify the reverbs so they're less obvious and more difficult to figure out, because that's the fun part! I'm gonna show you a bunch of tricks that are gonna be very useful for you to integrate your vocal within the playback track. Let's work on a trick to put some distance between you and the singer. Back in the day, a very smart German dude named Helmut Haas came up with the Haas Effect. Basically what you need to know about the Haas Effect is that if you have two signals, a Direct Signal and a Delay Signal, if the Delay Signal is close enough to the Direct Signal, they will be perceived as one, which we are gonna use to trick the brain into thinking that there is more space behind the Direct Signal than there is. Here's Pam from The Arrows singing the verse for "Prisoner", all dry. All I have here is a little bit of De-Esser, some light EQ, and a little bit of compression. That's the usual stuff. Now we're gonna talk about delays and reverbs. Decent Recording... Actually not too bad. Let me add some Standard Edition delay. You don't need a fancy delay for this. We're gonna start in the 20 to 50 ms range, because this is where the Haas Effect is most useful. Now... There is no absolute rule. You have to listen to your material and figure it out. But the rule is: under 50, it should be fine. Check it out. So I'm gonna put it up for you, for example, and slightly add more here with my Mix. It makes sense? As I add more of that little delay, it sounds like she's further and further away into some sort of a corridor. If I go into the 10 to 20% range, it sounds like this. You hear that it does this slightly. If I do it in the middle of the track, when she's singing, you'll hear it. I'll start with. It's a nice, little, subtle effect that lets you do this to the vocal without adding any gook, or any trail, or anything complicated to manage. So in practice for our purpose, you start getting a useable effect in the 20 ms range, all the way to the 50-55 ms range, depending on... the weather, what your singer sounds like, who's president, and the tempo of the song. If you are asking yourself why I put the Haas Effect delay straight on the vocal track, and not on a bus send, it's because in my brain, this really pertains to this one track. Also it's nice to be able to use that little slider to do a blend between the Direct Signal and the Delay Signal and find the right spot, at constant level. So that's it for the Haas Effect. Let's stay on delays for a while. On most of my sessions, I set up an 8th note and a 16th note delay because they allow me to add fat to the vocal without being so omnipresent and obvious. The fact that they are locked to the grid means that they will be somewhat hidden by the snare drum, the hi-hat, the bass drum, the bass, the kazoo, whatever you have on your track. Let me show you. I chose the Soundtoys EchoBoy because that's my go-to delay these days. Incredibly efficient! So this is what it sounds like. As I explained before, because the delay is tied to tempo, it's hidden by all the stuff that's playing around it. Just like with the Haas Effect, it's a good idea to EQ your delay, so I can high-pass the delay, so I cut all the bottom so it's not as thick. That's nice! It adds a little bit of tail, but it doesn't cloud judgment. And also, by default, I always have the high end kind of low-passed so it's not so bright. Without the EQs, it sounds like this. You don't have to high-pass and low-pass, but for my taste, I like the vocals to stay centered, I just want a little bit of a cushion, and this gives me a cushion. Another way to get a cushion is to use a 16th delay. So I use also the EchoBoy, and I have a Send called 1/16 Delay. It sounds like this. I'm gonna mute the 8th note delay so you can hear just the 16th note for a second. With just the Haas Effect, actually. So here we started dry with no Haas Effect and no delays. Haas Effect and the two delays. In the end it's your choice whether you want to hear or not hear the delays, and how much of them you want to hear and how much personality they have. You could go in and saturate the hell out of the 8th note delay and give it a real distinct sound, and that would be your sound. If you want it to be completely discreet, you high-pass, low-pass, and tuck it under, and it gives you that cushion, that bouncy thing under the vocal without loading your track and making it heavy and slow. The combination of the Haas Effect and a couple of delays that are tied to tempo really lets you put your vocal in the track without having too many artefacts. The 8th note delay and the 16th note delay have two different functions depending on your track. If you have a very dense track with a lot of stuff going on, you can use more of the 8th note delay and make it kind of like heavier, and the 16th note delay to fill the holes. If you have a very sparse track, the 8th note delay is gonna be too obvious and it's gonna show as a delay, so you might want to use more of the 16th note delay and use the 8th note delay very, very little, just for a bit of a tail. The combination of the Direct Signal and the two delays and the Haas Effect really lets you put your vocal in the track without weighing it down. Delays are also great to patch holes in vocal lines. Very often on choruses, you have a big beautiful line and then you have a hole in it. And because it's a chorus, and there's a lot of stuff going on, pads and guitars and stuff like that, it feels kind of lackluster to have the vocal stop. So it's in good taste to use a longer delay, say a 1/4 note, or even a 1/2 note, to create that kind of a traily long and kind of like expansive, with an A, sound on the vocal. Let me show you. what I did on the verses on the chorus so that the sound is consistent, and I'm gonna add on the chorus this echo. Echo, Delay, same thing, right? Lead Echo. This is what it would sound like in solo. You will notice that for the first time since the beginning of this video, we're actually using some feedback, meaning the delay is repeating itself. The reason for that is I want to hear this delay. This is gonna help me trail the vocal. The other delays were there to be discreet and create pseudo-acoustic spaces. This is really designed to be an effect that I can hear. You'll notice that I high-passed and low-passed, just like the other delays. It's just a longer delay with more feedback. Obviously that was too much. I'm lowering the amount so that it sounds normal and not completely overt. Here we go. See the difference in vibe. I'll do it again with. In this case, if I find that it's a little too obvious and too present, and not diffuse enough, I can high-pass it further, and it would sound like this. Or in the case of EchoBoy, I can actually change the tone of it because they've modeled different kinds of delays. I'm using an 'AM Radio,' which is gonna be pretty bright and aggressive. Maybe I wanna go to say... 'Tube Tape,' which is a little duller. That's nice. I can add more of it. With. 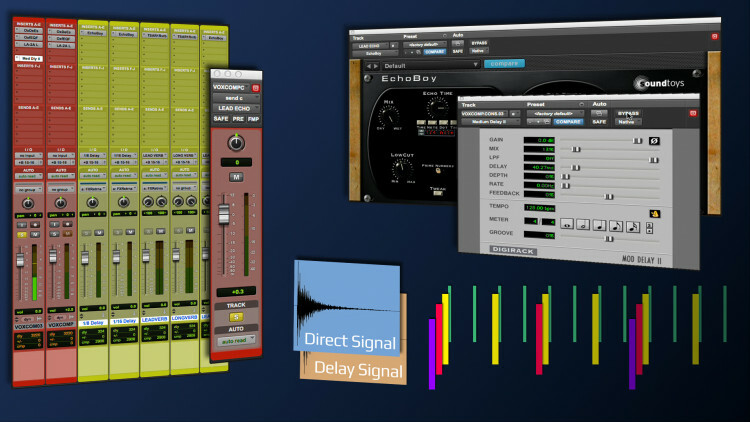 Check out how the delay helps the track and the vocal kind of like get together. It does that by creating a block of sound, more of a block of sound for the vocal, as opposed to just one phrase, silence, one phrase, silence. We have kind of a trail on the vocal. You could do that with reverbs but delays have a different personality. We'll look at reverbs in a different video. In summary, you have your vocal track, and it sounds too dry. First thing you might want to do is use the Haas Effect to put a little distance between you and the microphone. Second, you might want to use a 8th note or 16th note delay to create that bounce and that cushion under the vocal, within the track. If your track is sparse, you can use a 16th delay, because it won't show as much. If your track is a little more dense, you can use 16th and 8th note delay combination thereof. Season to taste, your mileage will vary. And then, if you have a big arrangement, usually on choruses, with big pads and guitars that soak up a lot of the ambience you already have made with the Haas Effect, 8th and 16th note delay, then you might want to add a 1/4, or a 1/2 note delay, season to taste also, that would let you fill the holes and give a trail to the vocal so that the track sounds like one piece of music, as opposed to just a vocal over a track. Should you use a Haas delay for all vocals, including harmony, doubles or background? Or is this primarily for the lead vocal? Both the video and the content: fabulous. But Fab speaks very quickly and the translation written in Spanish sometimes does not give time to read it. There are also phrases that are not well translated (or Fab says strange things) and have no meaning in the context. Thanks you! Clear and helpful! really great!! best regards from Chile. @CCHorton: Universal Records did not do the best job at distributing this otherwise fantastic record. The best would be to write to the artist. They are great people. @djdrew: Both. As you get more used to the sounds you'll be able to decide which you;re in the mood for that day. Great stuff Fab! So would you use this as an addition to reverb or as an alternative? Awesome video! I was trying to find Disaster Queen, but iTunes and Amazon only have them on mp3, which I find unacceptable to listen to. Any idea where I can get a real, full resolution, tangible copy of their album??? Awesome vid, Fab. Thank you. Sweeeet! Multiple delays, thanks for the breakdown! ahhhhhh!! I've never gotten delays to feel right to me. I love the fact that you talk about philosophy rather than just technique. Best tutorial on how to use delay EVER!!!! Thanks Fab. Love it! Thank you, that's a new take on delay for me. great. I know that delays are "cleaner" than reverbs, but they do not create the same spaces that we sometimes need. The question is... when talking about just pushing back a track in the mix, whats better? short reverb (bedroom/office) or haas? I feel that the delay causes a lil more comb filtering.